Michael Browne’s concerns are widely held, for the unpredictability of whole cluster fermentation can result in a wine that is herbaceous, vegetate or green. On the other hand, if the stems are mature and the clusters are never crushed, pumped or damaged in any way to avoid the release of juice from the stems into the wine, the resulting wine can be enhanced by whole cluster inclusion. Whole cluster fermentation refers to the fermentation of intact clusters of grapes (Dijon clusters are pictured) as they are picked from the vine with no intervention of machines leaving all berries and stems (the part of the stem which holds the grapes is called the rachis) intact. Traditionally, red winemaking begins with crushing of the grapes to start to release the contents of the berries and de-stemming to remove the grapes from the rachis. A mechanical crusher/de-stemmer is often used. The stems are often removed in red winemaking before fermentation since the stems have a high tannin content and when unripe, stems can give the wine a green aroma due to extraction of 2-methoxy-3-isopropylpyrazine which has an aroma reminiscent of green bell peppers. With Pinot Noir, even if the clusters are de-stemmed, the grapes are usually left uncrushed (“whole berry”) to encourage the development of desirable aromas through partial carbonic maceration (fermentation within the grape coincident with fermentation of the juice which seeps out of the grape). A recent tasting I did in the cellars of Freestone Vineyards with winemaker Theresa Heredia started me thinking about whole cluster inclusion and how it can affect the aromas, flavors and tannin structure of a finished wine. We tasted together three samples of 2008 Pinot Noir from barrel that had no stem inclusion (100% de-stemmed), 30-40% stem inclusion and 100% stem inclusion. I could clearly taste a step up in aromatic and flavor complexity with increasing amounts of stem inclusion along with a more bold and lengthy tannin structure. 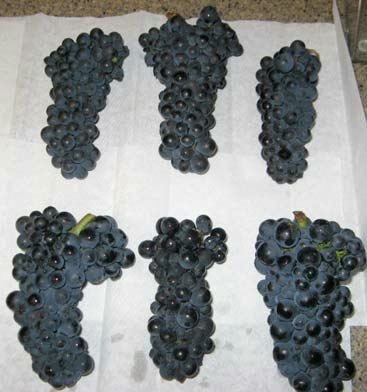 When ripe stems are properly managed, it was clear to me that their inclusion produced a superior Pinot Noir. The Burgundians have practiced stem inclusion for centuries, as historically they had no de-stemmers. Today, many notable Domaines are advocates of whole cluster such as Dujac and Domaine de la Romanee-Conti. The New World has largely moved away from whole cluster fermentation or limit it to 10% to 30% of the clusters. There are, however, some devotees who use as much as 100% whole cluster in selected wines (Ambullneo, Freestone Vineyards, Native9, Tantara, and Windy Oaks among others) with favorable results. I polled a number of prominent Pinot Noir winery owners, winemakers and a Professor at University of California Davis to ask them about their understanding of the contribution of whole cluster fermentation to Pinot Noir. None could elucidate the exact biochemistry involved as this has apparently not been clarified, but their responses shed considerable light on the role of whole cluster fermentation in Pinot Noir winemaking today. I have excerpted their comments for brevity. Theresa Heredia, Winemaker, Freestone Vineyards “Like the grape skin, stems contain phenolic components, including tannins. Not removing the stems can help improve the phenolic structure of Pinot Noir since it is a thin skin grape and has little tannin naturally. The stems also contain pyrazines so if the stems are not ripe enough, they can cause herbaceous characteristics in the wine. However, the combination of the pyrazines and tannins, along with the many other natural components that stems contain, can add plenty of lovely spice characteristics to the wine. The riper the stems, the spicier the flavors. The greener the stems, the more herbaceous the wine can become. We pick with lots of natural acidity and lowish Brix so that the wine is 13.0% to 13.5% alcohol, pH 3.5 or lower. We always notice a better phenolic structure and complexity of aromatic profile in wines such as these, when we use at least a percentage of whole clusters. We only use whole clusters if the stems are beginning to lignify and only if they are relatively thin. In 2009, I opted to only do two 100% whole cluster fermentations because the stems were too thick, juicy and were not very lignified. I did use some percentage of whole clusters, though, with tremendous results. It is a challenge, but it can be done and the result is lovely." 1. If the vintage and region lends itself to some percentage of whole cluster, I like to use whole clusters. I find it adds an extra dimension to the palate and aromas of a wine. 2. Importantly, I find that adding a percentage of whole cluster adds aromatic freshness to older Pinot Noirs. A Pinot Noir that is ten years old and has a percentage of whole cluster will be more aromatically complex than the same wine 100% de-stemmed. 3. Region and vintage are the deciding factors. There are some regions where stems do seem to retain an aggressive green character and therefore it is difficult to do much whole cluster. By the same token, there are regions which seem to benefit dramatically from a percentage of whole cluster as the added complexity really changes the wine. An example is Central Otago, where some of my favorite producers do whole cluster and where we are doing quite a bit at Burn Cottage Vineyard, my client there. The Central Otago fruit seems to really benefit from whole cluster. 4. Stem ripeness varies dramatically from vintage to vintage and this is an important consideration. Ripeness is in the eye of the beholder. I will never forget a tasting with Henri Jayer in his cellar in around 1984 when he stated emphatically that there are never ripe stems in Burgundy. Laura Volkman, Laura Volkman Wines (Oregon) "While I don't have experience with whole cluster fermentation, I do have a few comments. My theory is that the stems/rachi need to be mature and brown at harvest to add desirable wood stem tannin and aromas to the wine. In a cool year, the stems could add those undesirable bitter harsh green tannins and make the wine herbaceous. In an optimal year, I have worked with winemakers who add 10% or so whole clusters to the fermenter and the wines ultimately show more tannin, toast and nice astringency than if the stems were not added. These winemakers ran the rest of the grapes through the crusher. In carbonic maceration whole cluster fermentation, the grapes are not run through the crusher to avoid twisting and scraping of the stems during processing and maintain whole berries. They are added directly to the fermenter and the extraction is done in a carbon dioxide saturated environment. The theory is that whole cluster is more gentle on the fruit overall, more of the berries are left intact along with the stems/rachis, and any extraction from the wood stems is softer allowing more of the fruit to show through. While I think whole cluster wines are lovely and I enjoy them on occasion, my style is more traditional with gentle punch downs that extract tannins from the skins and seeds. I can control and balance this with fermentation temperatures and more or less aggressive punch downs. I think tannin extraction is very personal to the winemaker's palate, especially post fermentation. We need to get our head and hands in the fermenter during this time to know when to press off.